After I decided to rip out the seams of the upside back ( or was it front? ), I turned on a recorded episode of Castle and started gently ripping out stitches. After a few inches, I went to some brighter light and verified what I was suspecting. The fabric was ripping from the tension on the thread. I guess the beautiful stretch stitches that my Husqvarna Viking Topaz makes did it again. I have never been successful ripping out its stretch stitches. Notice the T for top and H for Hem? I made a quick decision to run and grabbed some black Ponte I had planned to use with this same pattern. Again, I set the stopwatch. Since the earlier one was so loose, I decided to go down a size(yippee!). I decided to double check that all of the notches were marked and did the assembly. Earlier I used just the sewing machine, but this time I pulled out the serger. In addition to the notches, I also used my chalk pen to label the top and the hem. I also marked the stitch line. It went together quickly and I tried it on before attaching the waist. It was a little snug, but it wasn't stressing the seams and the side seams were staying vertical and straight. 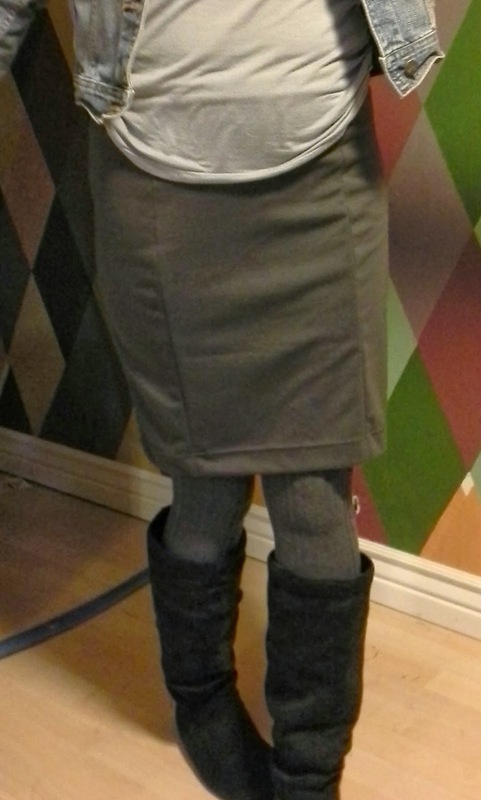 I decided to serge the grey skirt. I used the same black thread and zipped through. Of course, I checked and double checked that it was together correctly by measuring the top and bottom of the panels. They weren't the same as the pattern any more and the hem tapered in slightly after fixing the messenger up. I tried this skirt on pre-waistband....and it fit!. A little snug, but I have if I lose weigh it will still fit. Or, will Murphy stop my weight loss? Now it was time to add the waist band. 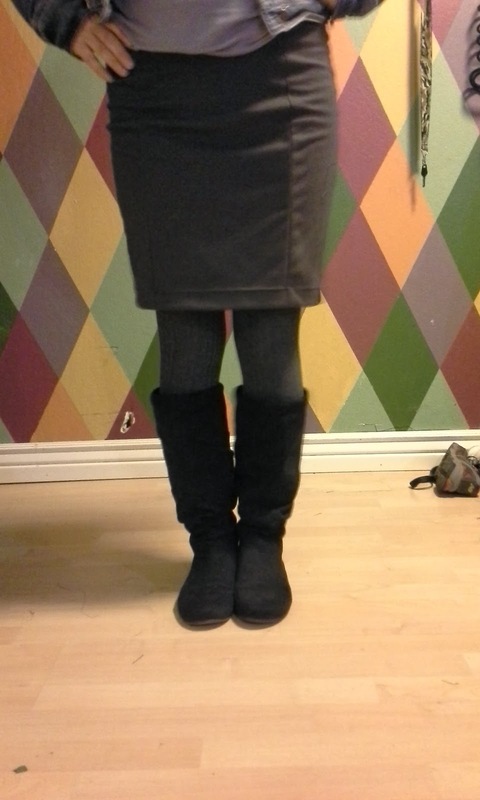 It was also snug, so I decided not to use elastic on either skirt. I tried them on again. No problem. I was pretty happy. 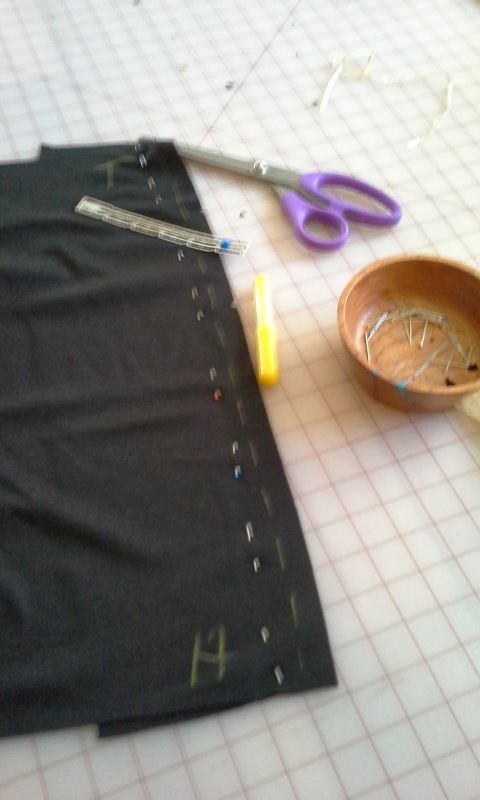 I sat back down to pin thee hems and continue with Castle. It was getting pretty interesting, a fire had a couple of the detectives stuck in the basement while one of the wives was onsite in an ambulance in labor. I pinned both hems and changed the needle to a double stretch needle, changed thread, wound a bobbin and started my hem. My thread broke. Luckily, I was able to rip out these stitches without a problem. It happened again, but I was almost done. Finally, I made it all the way. I was ready to cry. My one hour, two tops was way over hours ago. I decided I could deal with skipped stitches for now. I changed threads again and finished the grey skirt. I have decided the right needle of my double needle has gone bad. I'll need to buy another next time I'm at Joann's. Total time for both skirts was just under four hours. This includes the time to deal with my huge mistake with the skirt, setting up and threading the serger, reading some emails, sending some texts and dealing with kids returning from school. Oh, and a phone call from a friend while serging. I stopped sewing for a few minutes because all she could hear was the serger. I thought my new phone was supposed to suppress background noises? Next time, an hour. I've worked out the issues. All in all, I love this pattern. Maybe my next one is in brown, or tan I also have a purple in a different fabric. Hmmm. Love the look of the untucked shirt! Update: The skirts are snug, but that works for how I plan to wear them. In these photos I am wear cotton cable tights that are too big and a camisole tucked into the skirt. Definitely not a good look with these skirts. I tried them on with nylon/lycra tights and the skirts are not as tight and there are no lumpy bumpy effect. I wish Mr. Toad would have had the camera to redo the pictures. After a day of wearing the grey skirt, I would not recommend leaving out the elastic. Each step seemed to slide the skirt down little by little. It made my afternoon a little anxious with having to constantly check that I wasn't sagging. I might be opening a seam to add it. I'm so glad I used the serger. 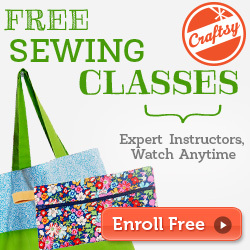 The serger seams are much more forgiving and much easier to rip out. I am glad to know u am not crazy. I could not find 0914 anywhere. Thanks for the clarification. Are the measurements accurate? I normally see a 14 or 16 pant. 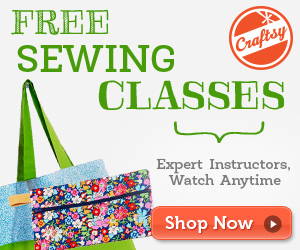 Will I need to add to my side seams? 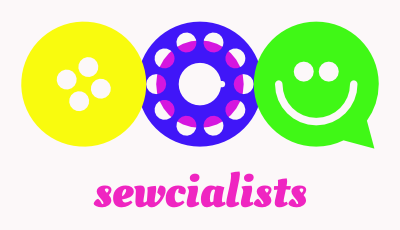 Sew FUNctional, you are definitely not crazy! I would look at the pattern pieces finished measurements. Since this is made with knits, I would suggest going a little smaller. 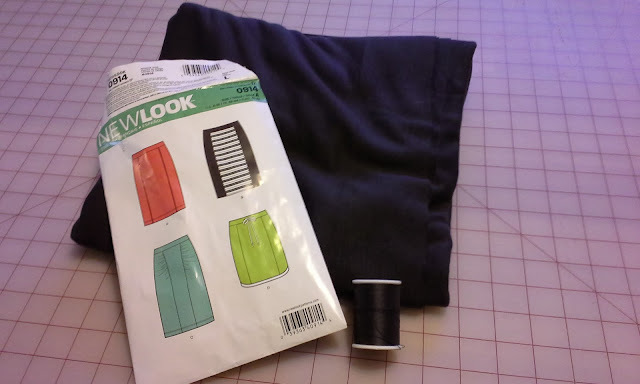 The pattern is pretty easy to make smaller, as long as you do it before attaching the waist band. So I finally finished this skirt. Thank you for 1) helping me not go a size up and have something too big. 2) warning me to not laze-out and skip the waistband. It all worked out fine. Now I'll have to sew it in a better fabric.